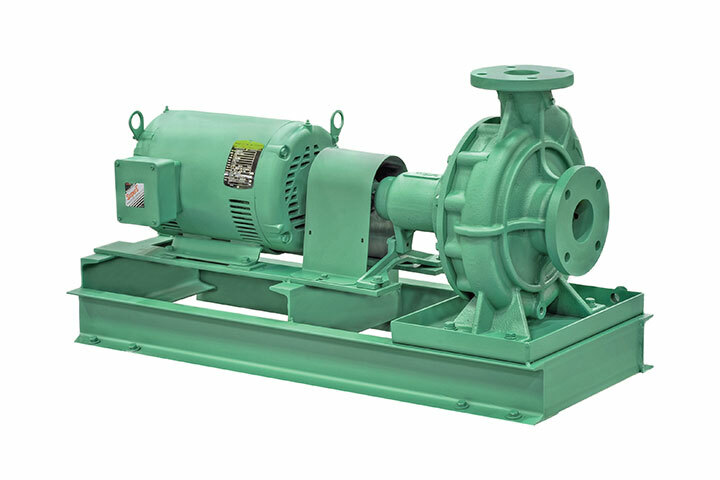 Taco FI Base-Mounted End Suction Pump - BBC Pump and Equipment Company, Inc.
Taco FI Series Pumps provide quiet, dependable power plus hydraulic performance and dimensional characteristics that meet the very latest standards. The improved bearing frame design features sealed-for-life bearings that meet all industry requirements for a minimum L 10 life of 60,000 hours, and optional, re-grease able bearings are also available. An easy-to-replace, slip-on shaft sleeve facilitates seal maintenance in the field and lowers maintenance costs. Taco’s exclusive dry shaft design protects the pump shaft by eliminating contact with the circulating fluid, so corrosion-resistant shaft materials are generally not required. FI Pumps also feature flush seal line taps, allowing the installation of a filter to protect the seal from non-condensable particles present in open systems. In addition, pressure tappings on suction and discharge connections are provided as a standard feature.